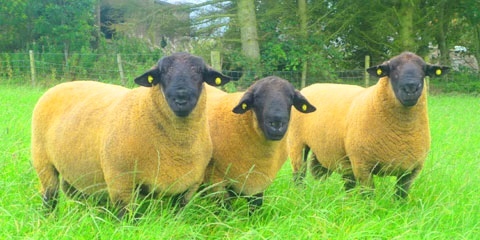 Essie Suffolks based in the North East of Scotland produces High EBV Index Suffolk shearling rams for commercial and pedigree flocks. Flock registration H6. We produce naturally fleshy, long, wide shearlings with good skins with an emphasis on growth rate, confirmation and size for both terminal and maternal use. Our Shearlings are naturally produced on a grass based system. After the 20 week weighing and scanning, the lambs are turned out to grass for the rest of the year. They are out-wintered all winter and the shearlings begin a supplement of oats in July. We believe that by maturing naturally our shearlings achieve their mature weight, size and strength naturally and go on to perform consistently for years. After the standard performance recording at 8 and 20 weeks, we transport 15 of our ram lambs to Edinburgh for CT scanning. This allows us to measure meat to bone ratio in the lambs more carefully, helps us to calculate a more accurate index measurement, and assists in maximising the accuracy of our genetic breeding values. Attention to health is paramount within the flock. The flock is MV Accredited, Scrapie Monitored, CLA tested and clear (for 11 years now). All stock rams have been genotyped ARR/ARR for many years. At least another 10 top tup lambs are tested every year and also result in ARR/ARR results. At Sales (Kelso and Dingwall) Essie Shearlings are presented naturally. They are not trimmed or dressed and have not been fed cabbages. 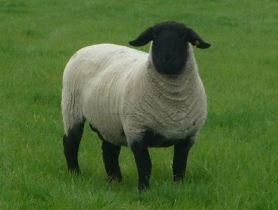 Since the merging of all recorded Suffolk flocks in the National Suffolk Breeding Evaluation, Essie flock average Terminal Index has steadily and impressively improved to 5.29 (top 1%) and 297 (top 1%) maternal. “Essie flock average Terminal Index has steadily and impressively improved to 5.29 (top 1%) and an excellent Maternal Index of 297 (top 1%).